You can get paid in-person with a POS that fits your business. Easily manage and help grow your business when you use a PayPal card reader with one of our POS partners. Customers can pay by chip, swipe and tap like Apple Pay® and Google Pay™, at the point of sale or on the go. What’s a POS? And how does PayPal fit into point of sale? A point of sale (POS) system enables businesses to conduct sales, and manage inventory and customer data. PayPal has partnered with a number of industry-leading POS providers to process nearly all forms of payment – making it easy for you to start getting paid. Why choose PayPal payment processing when you select a point-of-sale partner? Get a low rate of 2.7% per U.S. card swipe without long-term commitments or hidden fees. * You may even be eligible for special rates. The world is moving to a more secure payment method—EMV. We’ll help you accept the latest chip card at point of sale. PayPal monitors for fraudulent transactions 24/7, and supports EMV-certified devices to help keep customers’ financial information protected. When you need assistance, our Customer Support team is available to help. Reach us at 1-877-569-1136. *For non-U.S. cards, there’s an additional 1.5% fee applied to the transaction. Fees are subject to change. See our current pricing. Start by choosing a POS that’s right for you. All of our POS partners offer robust solutions for accepting in-person payments—and each is tailored to a specific business. Explore your options, and let us know if we can help. PayPal is integrated into each, so linking your PayPal and POS accounts will be a snap. Vend lets you easily manage and grow your business in the cloud using one of America’s leading POS solutions for inventory management, ecommerce, and customer loyalty. Lavu’s POS system helps restaurants, bars and nightclubs, quick-serve businesses, and other hospitality industries, making it easier to manage the business and take orders. Talech’s intuitive design allows you to create orders, apply discounts, manage inventory and view sales with just a few taps – whether you run restaurants or retailer stores. Brightpearl is a retail-focused POS designed to work seamlessly with your business. It provides a complete picture of your business, from inventory to real-time accounting. TouchBistro's POS helps restaurants succeed by helping full- and quick-service restaurants streamline sales, improve service, and inform key business decisions. 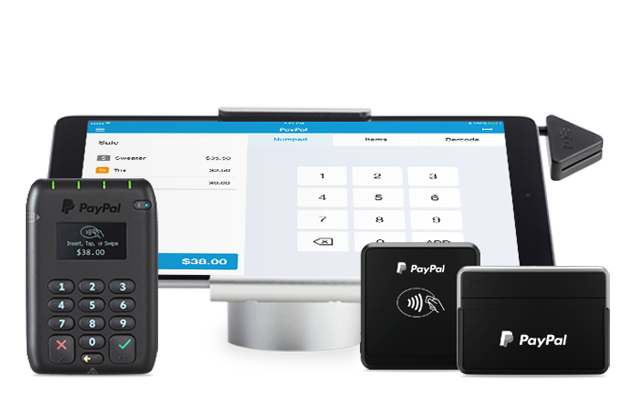 Get up and running fast with PayPal card readers supported by our POS partners. Learn more about our readers, accessories, and bundles. PayPal empowers you to do more. Looking for a simple app solution? PayPal Here helps you get paid just about anywhere your business takes you. One PayPal account for online and in store helps streamline your business operations—and you also have access to a diverse suite of other products and solutions. Apple Pay is a trademark of Apple Inc., registered in the U.S. and other countries. Google Pay is a trademark of Google Inc., registered in the U.S. and other countries. **PayPal Working Capital is subject to credit approval, as determined by the lender, WebBank, Member FDIC. To apply for PayPal Working Capital, your business must have a PayPal business or premier account for at least 90 days and process between $15,000 (or for premier accounts $20,000) and $20 million within 90 days or within any time period less than or equal to 12 months. PayPal sales include processing on PayPal Express Checkout, PayPal Payments Standard, PayPal Payments Pro, and PayPal Here. ***Card is issued by The Bancorp Bank pursuant to license by Mastercard International Incorporated. The Bancorp Bank; Member FDIC. Mastercard is a registered trademark, and the circles design is a trademark of Mastercard International Incorporated. The card may be used everywhere Mastercard is accepted. See Cardholder Agreement for complete details. Sign up for a POS account. Call one of our POS partners or visit their site. Go through our partner's admin portal or call PayPal at 1-855-456-1321. Link your POS account and your PayPal account. Go to your new POS account, select PayPal as your payment processor, and purchase your reader. Interested in the code behind the payments? Learn more about the PayPal Here SDK.